Community and collaboration are among the key principles that guide our work at NCGS. We believe in engaging the power of many voices to strengthen our schools, community, and world. 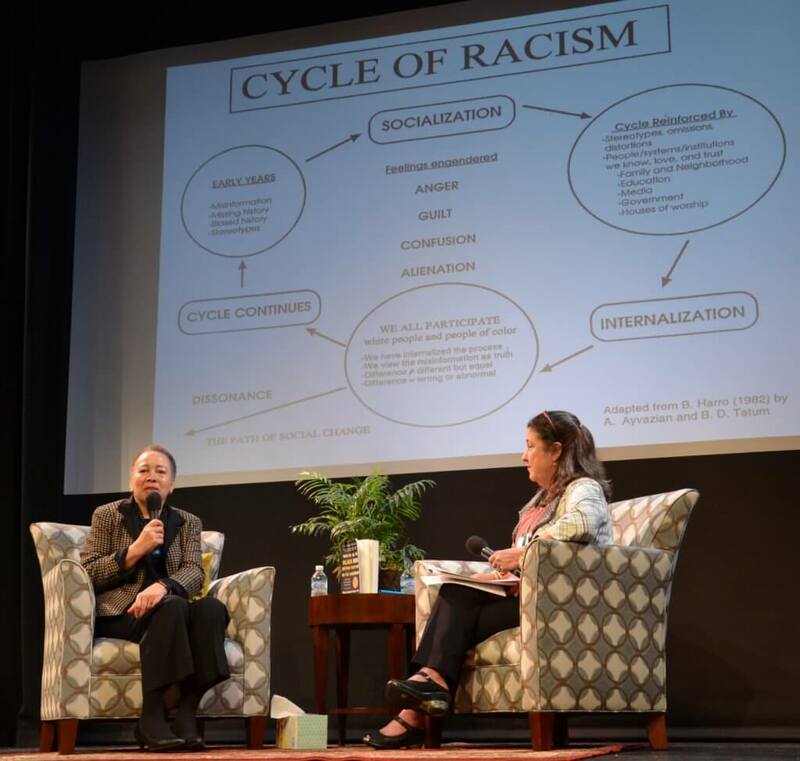 Dr. Beverly Daniel Tatum was recently interviewed by NCGS Trustee and Head of Laurel School Ann Klotz at the opening session of our recent Educating Girls Symposium, School Communities: The Power of Many Voices. Dr. Tatum addressed how the various communities in our schools — students, teachers, administrators, parents, alumnae — can collaborate to create spaces where girls feel safe, valued, and successful. Her powerful remarks reminded us of the importance of speaking up to ensure students of all ages are supported and guided as they learn about difference and identity. She impressed upon us that we must nurture our girls’ voices in a productive and constructive manner to ensure we are fostering inclusive environments. The following are excerpts from Ann Klotz’s and Dr. Tatum’s conversation. Q. What strategies do you recommend to teach students about difference and identity that can help educators address racism within our school communities? A. To understand how racism works in our society, it is foundational to learn about the cycle of racism. The cycle starts in our early years with misinformation and biased history. As we move through socialization, stereotypes are reinforced by society and misinformation is internalized. We all participate in the process allowing the cycle to continue. This could describe the cycle of sexism, the cycle of antisemitism, the cycle of heterosexism — choose your -ism, the process is the same. Children are born ready to take in information. In those early years, children absorb information we wished they didn’t, but is part of their environment. Children are exposed to stereotypes in books, on television, and the language they hear people use. Misinformation is also a part of what we are learning in our early years. A classic example is that Christopher Columbus discovered America. As we are socialized, we take in stereotypes, misinformation, and biased history. We don’t know it is wrong and it gets reinforced by people and institutions we know, love, and trust such as family and neighbors, teachers, media, and our government. We receive information from all sources and it is like breathing smog: unavoidable. All of us, including children, are taking in this misinformation and internalizing it. Sometimes we recognize it and sometimes we don’t, but we all participate in the process. We internalize what we are hearing, view the misinformation as truth, and learn not to see difference as normal but, instead, see difference as abnormal. The most important step in the cycle of racism is dissonance, which can cause us to break the cycle. When you become aware the cycle is operating, you can interrupt it to create a path of social change. You can ask questions, speak up, and take action. It is important to understand that as part of this cycle there are going to be feelings engendered — anger, guilt, confusion, alienation — but there are also feelings that come when you interrupt the cycle successfully, such as pride, happiness, joy. There are good things that come from the conversation. The trouble I find is many communities don’t engage in the conversation long enough. If you engage in it a little bit, what you get is the discomfort. You have to engage in the conversation over time to get past the discomfort and to begin feeling the comfort that comes from seeing change happen. Q. Will you talk with us about brave spaces; safe spaces? Many issues of the day feel polarizing and politicized, how do we make that work well for our students? A. The first thing from a leadership role is to be able to articulate why what you are doing is necessary. I find that sometimes school leaders will do something they think is important. For example, they create affinity groups, then get push back from adults who don’t understand why it’s necessary. The school leaders may lose their courage because they haven’t fully articulated why it makes sense pedagogically and developmentally. If we are not clear in our rationale, we can sometimes find ourselves in a situation where people are attacking us inappropriately. You have to be ready to talk about why you’re doing what you’re doing and be able to explain it. Sometimes leaders succumb to pressures without taking the time to educate their audience. Q. You’ve spent a significant part of your professional life in women’s colleges. What do you think about the experience of a girls’ school? A. The experience of girls’ schools and women’s colleges provides space for real development of confidence and empowerment where girls or young women can do anything and where there are plenty of examples and role models. The confidence that comes from that is really tremendous. As we look at the women leaders in our society, it’s not surprising that many have all-female education in their background. Q. How does one teach difference in the early years — ages four, five, six — when children don’t necessarily see difference? A. Children do see and comment on difference. My observation is sometimes teachers aren’t hearing the difference. For example, many years ago my oldest son came home from his preschool and shared, “Tommy said my skin is brown because I drank chocolate milk. Is that true?” I asked the teacher how she was responding to questions about difference and she said, “It hasn’t come up.” But clearly it was coming up in places like the sandbox and at the snack table. I share this to say children do notice, make comments, and ask questions. There are some really good resources for talking to young children and how adults can bring in questions of fairness and unfairness, which are concepts young children can understand. As a resource, I recommend a book published by the National Association of the Education of Young Children (NAEYC), which is Anti-Bias Education for Young Children and Ourselves by Louise Derman-Sparks and Julie Olsen Edward. It’s a really useful tool because it gives examples of learning principles for talking to young children about issues of social justice and multicultural education. Dr. Beverly Daniel Tatum is President Emerita of Spelman College and a clinical psychologist widely known for her expertise on race relations and as a thought-leader in higher education. In 2017, she was the Mimi and Peter E. Haas Distinguished Visitor at the Haas Center for Public Service at Stanford University. She is the author of several books including the best-selling Why Are All the Black Kids Sitting Together in the Cafeteria? : And Other Conversations About Race (now in a new 20th anniversary edition). Dr. Tatum was the 2014 recipient of the American Psychological Association Award for Outstanding Lifetime Contributions to Psychology and the 2013 recipient of the Carnegie Academic Leadership Award for her visionary leadership as president of Spelman College (2002-2015).